Robert Gibson Tilton (born 1946) is an American televangelist of the prosperity gospel widely known for his infomercial-styled religious television program Success-N-Life, which at its peak in 1991 aired in all 235 American TV markets (daily in the majority of them), brought in nearly $80 million per year, and was described as "the fastest growing television ministry in America." Within two years after ABC's Primetime Live examined Tilton's fundraising practices, beginning a series of investigations into the ministry, his program was taken off the air. Tilton later returned to television via his new version of Success-N-Life airing on BET and The Word Network. According to Tilton’s autobiographical materials, he had a conversion experience to evangelical Christianity in 1969 and began his ministry in 1974, taking his new family (including then wife Martha "Marte" Phillips, whom he married in 1968) on the road to, in his words, "preach this gospel of Jesus." Tilton preached to small congregations and revivals throughout Texas and Oklahoma. Tilton and his family settled in Dallas, Texas, and built a small nondenominational charismatic church in Farmers Branch, Texas, called the “ Word Of Faith Family Church" in 1976. The church also started a local television program then known as Daystar (not related to the Daystar Television Network, though both were started in the Dallas area). Tilton's announcer on Daystar was Miami radio personality and voice-over artist Dave Mitchell, who was based in Dallas at the time. Tilton’s young church was growing steadily, but Daystar failed to expand beyond the Dallas area until Tilton went to Hawaii as his self-described version of Jesus’s forty days in the wilderness and spent time fishing, drinking, and watching an increasingly popular new form of television programming: the late-night infomercial. Tilton was particularly influenced by Dave Del Dotto, a real estate promoter who produced hour-long infomercials showing his glamorous life in Hawaii (which he constantly stressed anyone could achieve just by following the principles set up in his many “ get rich quick" books) as well as "interviews" with students who were brought out to his Hawaiian villa for said interviews, specifically for their on-camera testimonials about the success in life they were now enjoying thanks to his teachings. 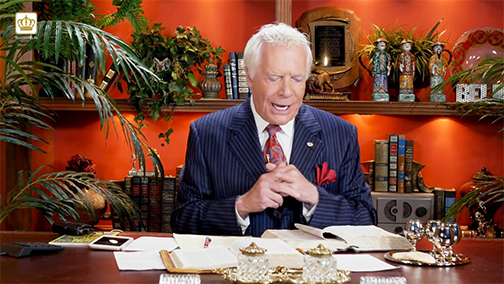 Upon his return from Hawaii in 1981, Tilton, with the help of a US$1.3M loan from Dallas banker Herman Beebe, revamped Daystar into an hour-long “religious infomercial" with the title Success-N-Life.Pastor, Author, Televangelist and Fake. Word of Faith World Outreach Center Church, Muck Maker and Snake oil - Vitamin Salesman, Debaucher, Druggie, user of most drugs and makes a lot of money lying and cheating people. In 1991, Diane Sawyer and ABC News conducted an investigation of Tilton (as well as two other Dallas-area televangelists, W. V. Grant and Larry Lea). The investigation, assisted by Trinity Foundation president Ole Anthony and broadcast on ABC’s Primetime Live on November 21, 1991, alleged that Tilton’s ministry threw away prayer requests without reading them, keeping only the accompanying money or valuables sent to the ministry by viewers, garnering his ministry an estimated US $80 million a year. Ole Anthony, a Dallas-based minister whose Trinity Foundation church works with the homeless and the poor on the east side of Dallas, first took an interest in Tilton’s ministry in the late 1980s after some of the people coming to the Trinity Foundation for help told him they had lost all of their money making donations to some of the higher profile televangelists, especially fellow Dallas-area minister Robert Tilton. Curious about the pervasiveness of the problem, the Trinity Foundation got on the mailing lists of several televangelists, including Tilton, and started keeping records of the many types of solicitations they received almost daily from various ministries. Former Coca-Cola executive Harry Guetzlaff came to the Trinity Foundation after he had been turned away from Tilton's church when he found himself on hard times following a divorce. He had been a longtime high-dollar donor and gave up his last $5,000 as a “vow of faith" just weeks earlier. Guetzlaff's experience, combined with the sheer magnitude of mailings from Tilton's ministry, spurred Anthony, a former intelligence officer in the United States Air Force and licensed private investigator, to start a full investigation of Tilton's ministry. Guetzlaff joined Anthony in the task of gathering details on Tilton’s operation and later did much of the legwork in finding and following the paper trail for the ABC News investigation. In a November 21, 1991, promotional appearance for the Primetime Live televangelist investigation on Live with Regis and Kathie Lee, Diane Sawyer said that she had watched several televangelist programs, including Robert Tilton’s Success-N-Life, during her travels as a reporter and was "fascinated" by them, but also "disturbed". Stressing that she knew how sensitive people always are to reporters questioning religion, she said that she spoke with other reporters, and then eventually to ABC producers, who then decided to conduct their own investigation into a number of the more prominent televangelists, eventually settling in 1991 on the three featured in the Primetime Live episode: W. V. Grant, Larry Lea, and Tilton. According to Sawyer, the ABC producers, including Tilton segment producer Robbie Gordon, learned about possible resources available from Ole Anthony and the Trinity Foundation, and contacted Trinity for information on Tilton. After comparing their accumulated notes, data and details, the two groups decided to pool their efforts and began planning the undercover portion of the story. Anthony agreed to portray himself as a Dallas-based minister with a small church looking into the ways televangelist ministries could grow so quickly, and the ABC producers would pose as Anthony's "media consultants." Tilton later returned to television via his new version of Success-N-Life airing on BET and The Word Network. In 2008, Tilton stopped broadcasting his program on television and is now utilising internet media alone for his broadcasting. At a recent convention of Shamans, Fakirs Witch Doctors, Noted Hypnotists Voodoo Practitioners, Alien Supporters, Peyote Enthusiests, the Boogyman Association, and Meth Lab owners, Mr. Tilton was considered too fake to really know the word and was not sent an invitation to attend. Most asked what drugs was he on and where you can purchase some of his stuff. 2018 - Robert Tilton – Best known for “speaking in tongues” on live TV, an ABC expose on the man revealed that he spent 67% of his on-air time asking for money. Unfortunately, Tilton’s ministry seems to be all about Tilton. He used his money to purchase his half million dollar vacation home in Florida, and is fifty-foot Carver yacht, among other things. The ABC expose found that most of the prayer requests his organization receives are simply thrown in the landfill, after the cash is removed. The bolt of lightning, replacing the "Burning Bush", struck Rev. Tilton with Christianity in 1969. He began his ministry in 1974, taking a new wife and an old car on the road. Tilton preached to small congregations and small tent revivals throughout Texas and Oklahoma. Known as the The Bible belt and he had the Babel to go with the Bible. Tilton and his family settled in Dallas, Texas, and built a small church in Farmers Branch, Texas called the "Word Of Faith Family Church" in 1976. Upon his return from Hawaii in 1981, Tilton—with the help of a US$1.3M loan from Dallas banker Herman Beebe aka "the Putz" got started. Before the ABC News investigation, in a deposition video for a lawsuit that was taped August 18, 1992, Tilton admitted; Having robbed a fruit stand as a teen; Abusing marijuana, LSD, and various barbiturates; Drinking lots of alcohol and using lots of drugs" before his conversion. In 1991, Diane Sawyer and ABC News conducted an investigation of Tilton and two other Dallas-area televangelists, W.V. Grant and Larry Lea. The investigation, assisted by Trinity Foundation president Ole Anthony and broadcast on ABC's Primetime Live on November 21, 1991, found that Tilton's ministry threw away prayer requests without reading them, keeping only the accompanying money or valuables sent to the ministry by viewers, garnering his ministry an estimated US$80 million a year. He also went after Mike Murdock. Yes televangelists eat their own. Ole Anthony, a Dallas-based minister whose Trinity Foundation church works with the homeless and the poor on the east side of Dallas, took an interest in Tilton's ministry after some of the people coming to the Trinity Foundation for help told him they had lost all of their money making donations to some of the higher profile televangelists, especially fellow Dallas-area minister Robert Tilton. Former Coca-Cola executive Harry Guetzlaff came to the Trinity Foundation for help and told Anthony that Guetzlaff had been turned away from Tilton's church when he found himself on hard times following a divorce. He had been a longtime high-dollar donor, and gave up his last $5,000 as a "vow of faith" just weeks earlier. Guetzlaff's experience combined with the sheer magnitude of mailings from Tilton's ministry spurred Anthony, a former intelligence officer in the United States Air Force and licensed private investigator, to start a full investigation of Tilton's ministry. Guetzlaff joined Anthony in the task of gathering details on Tilton's operation, and would later do much of the legwork in finding and following the paper trail for the ABC news investigation. The evening of Nov. 21, 1991, ABC News aired a dramatic hidden-camera report that lifted the veil on Tilton's "fulfillment" operation in Tulsa, Okla. Video showed workers opening donor letters and setting aside checks and cash for deposit. They entered donor names and addresses into a computer, which then spit out a form letter saying Tilton had received their prayer request and was now asking God to help them. Investigators found many of the donor prayer requests in a Dumpster, according to the ABC report. Marte Tilton, the evangelist's first wife, with whom he had four children, recalled watching the broadcast and described the experience in a memoir published in 2000. "We sat motionless and speechless through the entire program," said Tilton's former wife, whom he divorced in 1993. "Overnight, we became objects of public ridicule and a flurry of lawsuits." The television report was devastating because Tilton had promised his viewers he would prayerfully ask God to help them with specific problems. The revelations prompted more than a dozen disgruntled donors to file lawsuits alleging that Tilton had engaged in fraud. Tilton migrated to South Florida, where he had maintained a vacation home. After a short second marriage, he found Maria Hortensia Rodriguez, 13 years his junior, and embarked on his third marriage. Trinity Foundation members, acting on this information, started digging through dumpsters outside Tilton's many banks in the Tulsa area as well as dumpsters outside the office of Tilton's lawyer, J.C. Joyce (also based in Tulsa). Over the next 30 days, Trinity's "garbologists", as Anthony dubbed them, found tens of thousands of discarded prayer requests, bank statements, computer printouts containing the coding for how Tilton's "personalized" letters were generated, and more, all of which were shown in detail on the Tilton segment within the Primetime Live documentary, now titled “ he Apple of God’s Eye". In a follow-up broadcast on November 28, 1991, Primetime Live host Diane Sawyer said that the Trinity Foundation and Primetime Live assistants found prayer requests in bank dumpsters on 14 separate occasions in a 30-day period. Tilton vehemently denied the allegations and took to the airwaves on November 22, 1991, on a special episode of Success-N-Life entitled "Primetime Lies" to air his side of the story. Tilton asserted that the prayer requests found in garbage bags shown on the Primetime Live investigation were stolen from the ministry and placed in the dumpster for a sensational camera shot, and that he prayed over every prayer request received, to the point that he "laid on top of those prayer requests so much that the chemicals actually got into his bloodstream. And... he had two small strokes in his brain. ”Tilton remained defiant on claims regarding his use of donations to his ministry to fund various purchases, asking, "Ain't I allowed to have nothing?" with regards to his ownership of multiple multimillion-dollar estates. Tilton also claimed that he needed plastic surgery to repair capillary damage to his lower eyelids from ink that seeped into his skin from the prayer requests. After Trinity Foundation members spent weeks poring over the details of the documents they and ABC had uncovered, sorting and scrutinizing each prayer request, bank statement, and computer printout dealing with the codes Tilton’s banks and legal staff used when categorizing the returned items, Ole Anthony called a press conference in December 1991 to present what he described as Tilton's "Wheel of Fortune," using a large display covered in actual prayer requests, copies of receipts for document disposition, and other damaging information which demonstrated what happened to money and prayer requests which the average viewer of Tilton’s television program sent him. When both Tilton and his lawyer J.C. Joyce reacted to the news by claiming the items Anthony was displaying had somehow been stolen by an insider, Anthony responded in a subsequent interview that Joyce was our mole—a lot of this stuff came from the dumpster outside his office. When Tilton returned to television in 1997, he established his ministry's headquarters in Tulsa, Oklahoma, where his lawyer J. C. Joyce's offices were located, and set up a post office box as its mailing address. A woman employed by Mail Services, Inc., a Tulsa-area clearinghouse that handled mail sent to Tilton’s ministry, said that when she worked for Mail Services, Inc. in 2001, prayer requests were still routinely thrown away after donations and pledges were removed. However, Tilton dropped the Tulsa address in late 2007 and used a Miami Post Office box to receive responses to his fundraising mailings. In January 2014, Tilton is currently holding services at the Courtyard Marriott in Culver City, California, while having donations again sent to a post office box in Tulsa. In 1998, The Washington Post reported that Tilton's following disappeared after the investigations but he had "joined dozens of other preachers to become fixtures on BET". Consequently, Tilton, along with Don Stewart and Peter Popoff received "criticism from those who say that preachers with a long trail of disillusioned followers have no place on a network that holds itself out as a model of entrepreneurship for the black community." Steve Lumbley, who worked for Tilton's ministry in 1991 when the original Primetime Live investigation took place, told a reporter for the Dallas Observer in 2006 that reports of prayer request disposal that were the centerpiece of the 1991 Primetime Live exposé were highly exaggerated. In an article for the dallasobserver.com blog “ nfair Park", Lumbley asserted that " the mailings all had some kind of gimmick. They weren’t godly at all. But the primary allegation that came out of that—that prayer requests were thrown away—was categorically untrue, and I can guarantee you that was not a normal practice." However, Lumbley, who now runs a Christian watchdog website called ApostasyWatch.com, does credit ABC and the Trinity Foundation for exposing Tilton’s unethical fundraising tactics, noting that " God was using Ole and ABC to chastise Tilton and bring him down." The Trinity Foundation still monitors Tilton's television ministry as part of Trinity's ongoing televangelist watchdog efforts. In a 2003 interview published in Tulsa World, Ole Anthony estimated that with none of the Word of Faith Family Church overhead and with television production costs at a fraction of the original Success-N-Life program, Tilton's current organization was likely grossing more than $24 million per year tax-free.